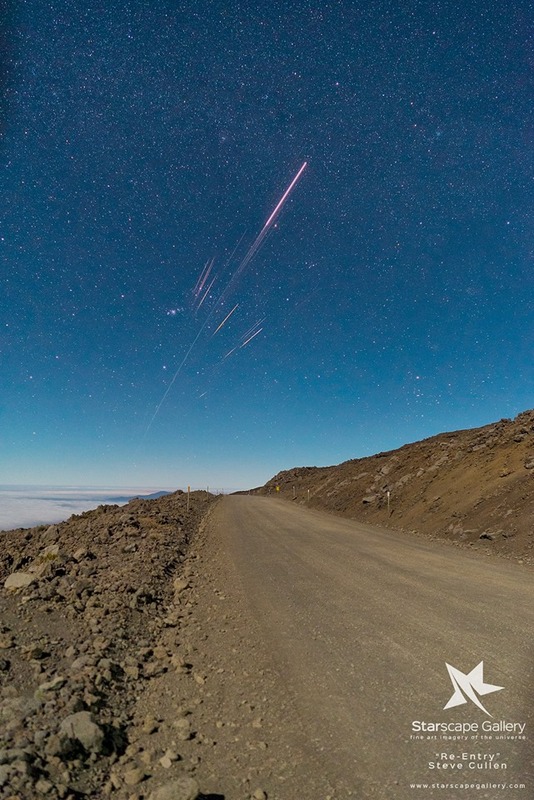 Truly spectacular photos of a re-entering rocket stage were captured on Saturday by astrophotographer Steve Cullen who happened to stop at just the right time to capture nightscape panoramas at Mauna Kea, Hawaii showing the blazing demise of a Long March 3B upper stage. 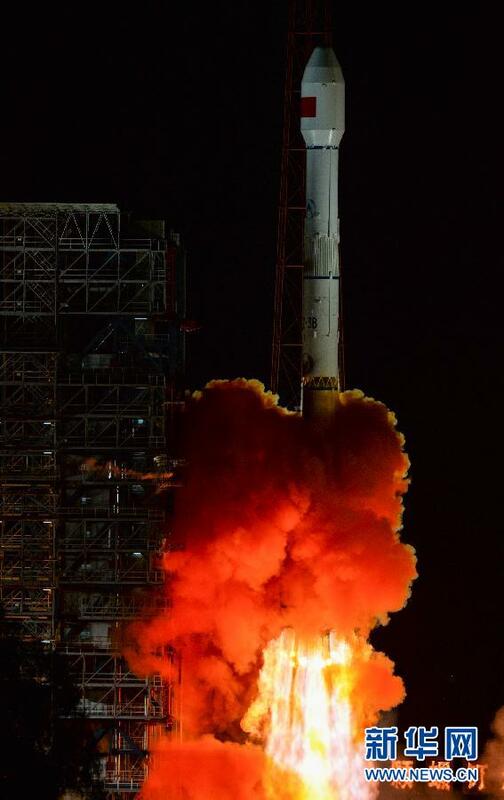 The rocket body that met its fiery fate in the skies over the Big Island of Hawaii was in action four and a half months earlier, launching as part of a three-stage Long March 3B rocket from China’s Xichang Satellite Launch Center. In a mission lasting 27 minutes, the third stage of the rocket conducted a pair of engine burns to boost the secretive Tōngxùn Jishù Shiyàn 1 (Great Wall Satellite 1) to a highly elliptical Geostationary Transfer Orbit. While the satellite continued to Geostationary Orbit on its own for what is reported to be a communications technology demonstration, the third stage of the rocket was left in an orbit of 182 by 34,890 Kilometers – skimming the very upper layers of Earth’s atmosphere every time it passed the low-point of its orbit where drag slowed the stage down, causing a progressive decrease of its speed and apogee altitude. 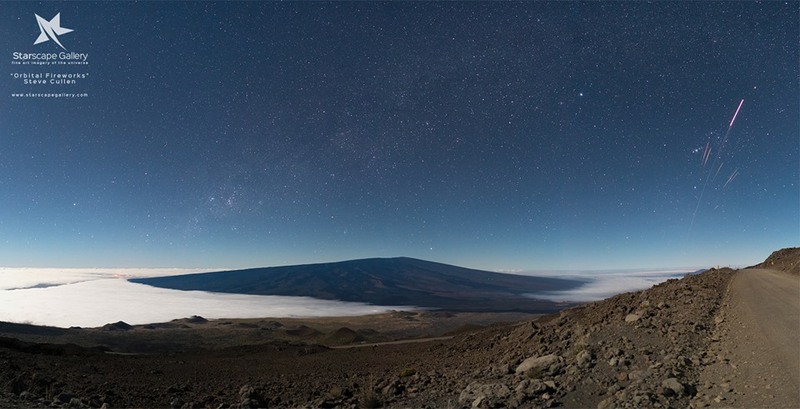 It took over four months for the stage to make its slow drop towards the dense layers of Earth’s atmosphere, being last tracked in an orbit of 95 by 822 Kilometers – on the verge of its deep dip into the atmosphere. 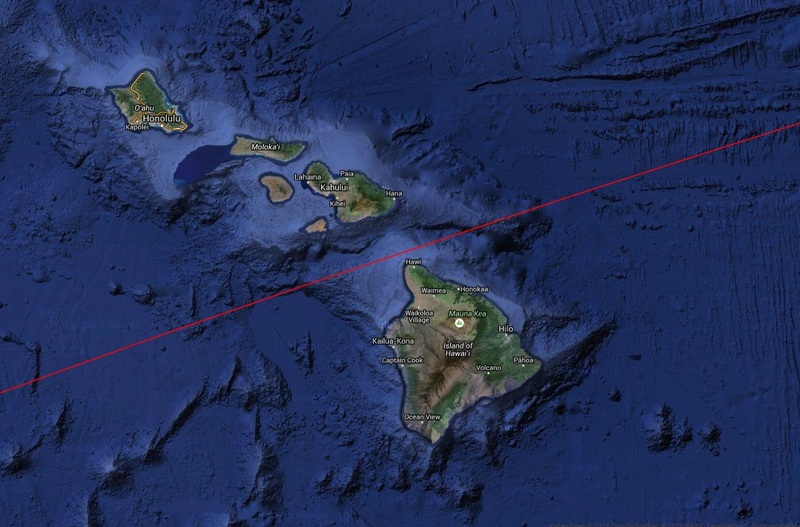 On approach to its final dive, the 2,740-Kilogram CZ-3B rocket body overflew northern Australia and Papua New-Guinea ahead of a long pass over the Pacific Ocean en-route to Hawaii. The onset of re-entry normally occurs between 120 and 100 Kilometers in altitude when the spacecraft encounters the dense layers of the atmosphere, initially not slowing down at a fast rate, but already interacting with plenty of molecules that are broken up into atoms and ions leading to plasma forming around the spacecraft which would normally become self-luminous around 104 Kilometers in altitude. Steve Cullen reported seeing the rocket stage as a small orange dot in the sky, resembling what any satellite would look like when passing overhead in orbit when illuminated by the sun. However, at 2 a.m. local time, virtually no low-orbiting satellites are illuminated by the sun, leaving only a spacecraft sufficiently close to the atmosphere that plasma was already forming around it. 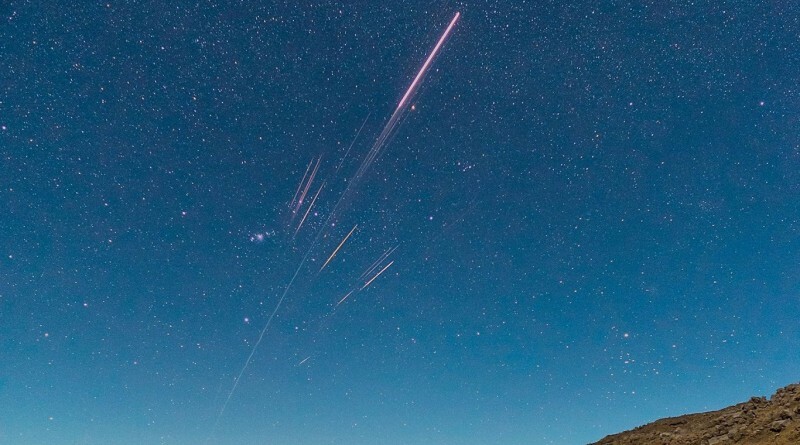 Cullen’s long exposure photos are truly remarkable as they show the entire re-entry process from the exo-atmospheric segment where the spacecraft is lit up by plasma, through the break-up of the rocket body and the trails of the individual debris, up to the lingering streak of atmospheric dust left after re-entry. Given the extremely high speed of the object at Entry Interface, air in front of the vehicle is compressed, creating a shock wave layer in which molecules are separated into ions and temperatures rise to the extreme. The Entry Point, defined by USSTRATCOM at an altitude of 80 Kilometers, marks the beginning of of the disintegration of the spacecraft (+/-10km) due to drag building up to a destructive force, triggering the onset of fragmentation of the spacecraft structure. The shock wave layer forming just in front of the spacecraft and any separated components leads to considerable heating that causes the incineration of the majority of the spacecraft structure. The mechanical deceleration experienced during re-entry can be up to 20Gs further crushing the structural components and causing the break-up of the spacecraft. Temperatures reached during re-entry can melt most metal types used on the spacecraft and most of the fragments created on entry fully burn up, leaving a cloud of dust and ionized metals in the upper atmosphere. The majority of spacecraft components burn up harmlessly in the atmosphere and never reach the ground, especially for rocket bodies that consist for a large part of thin metal that forms the propellant tanks. However, dense components such as spherical pressurant tanks and engine components can survive re-entry and reach the ground. In this case, any surviving components splashed down in the Pacific Ocean, north-east of Hawaii, some 1,000 Kilometers from the location of orbital decay. The Joint Space Operations Center tracks all objects in orbit and close attention is paid to re-entering objects using orbital tracking as well as ground- and space-based sensing systems that can detect the signature of a re-entering object, permitting an accurate determination of the decay time and location. For the CZ-3B rocket body, JspOC provided a re-entry time of 12:01 UTC on Saturday, January 30 with a window of uncertainty of +/-1 minute, in good agreement with Cullen’s observations. Re-Entry Prediction: January 30, 2016 – 12:01 UTC +/-1 Min.